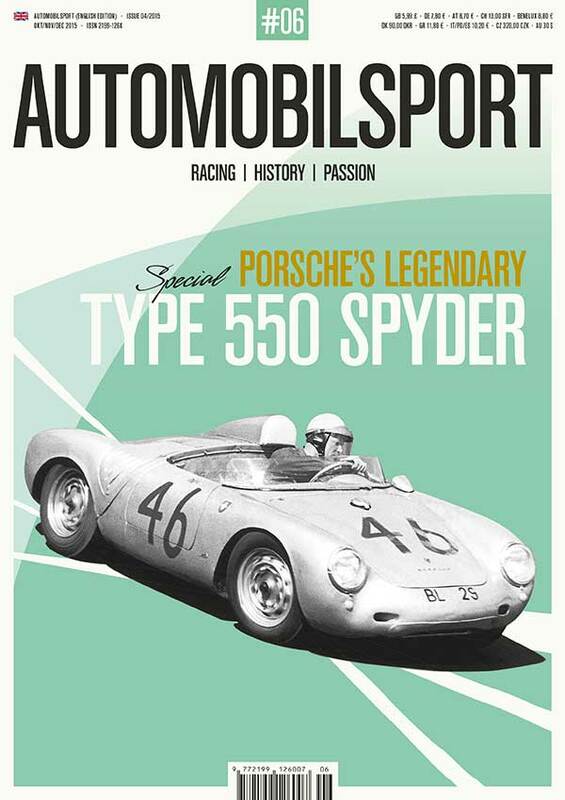 Porsche’s Type 550 Spyder achieved so much success in so many parts of the world for so many years that it must be the greatest sports-racing car in history. 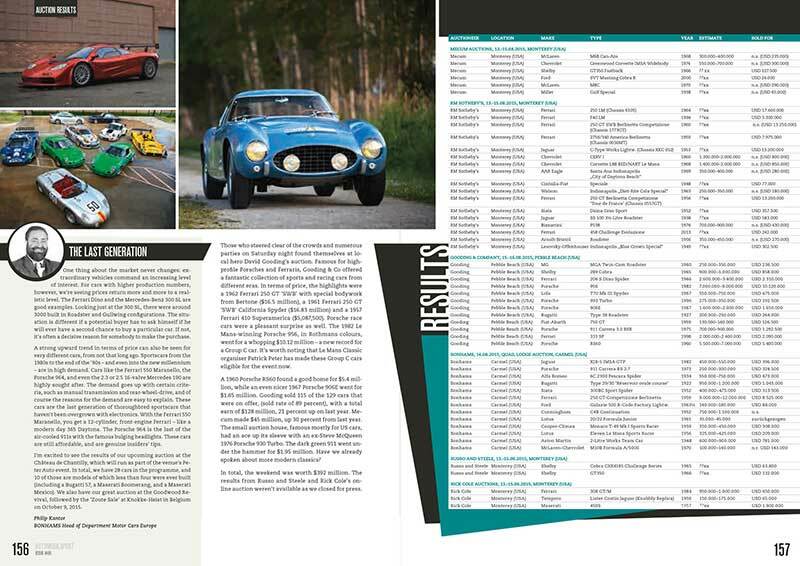 Dominating its 1½-liter class, in race after race the Spyders punched well above their weight to rival vastly bigger cars. 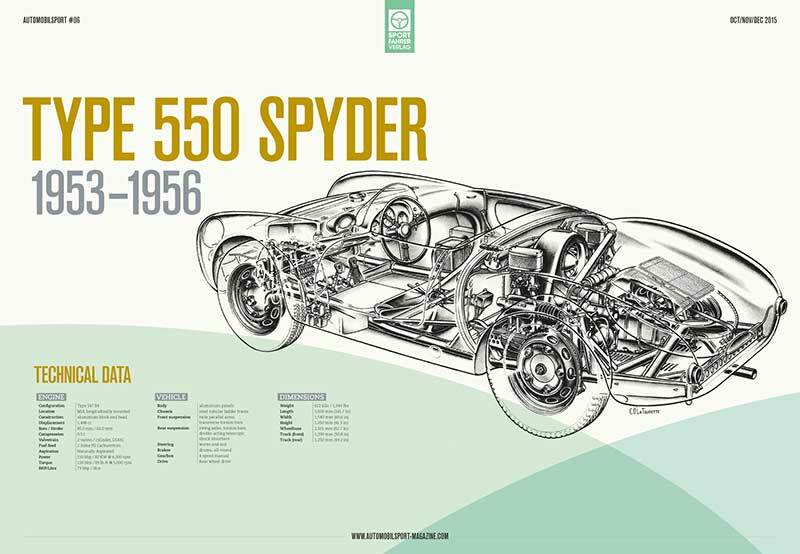 It all began with the production Spyders of 1955. 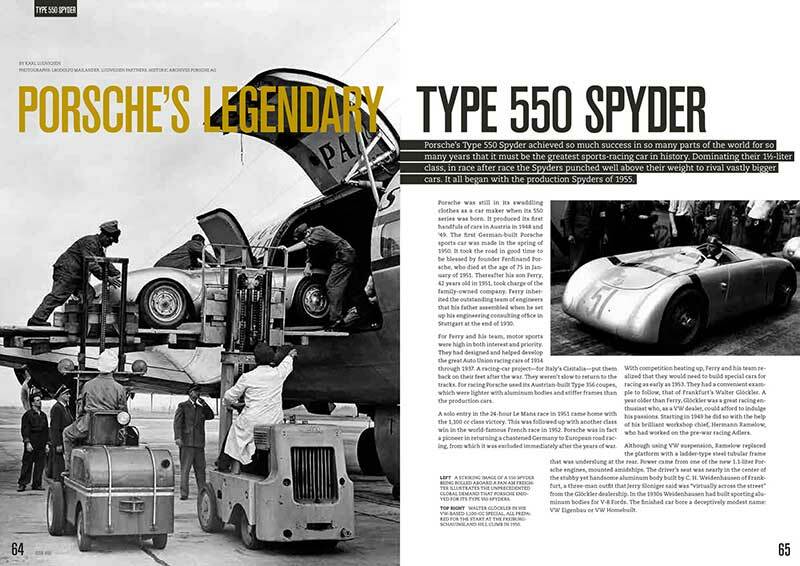 Porsche was still in its swaddling clothes as a car maker when its 550 series was born. 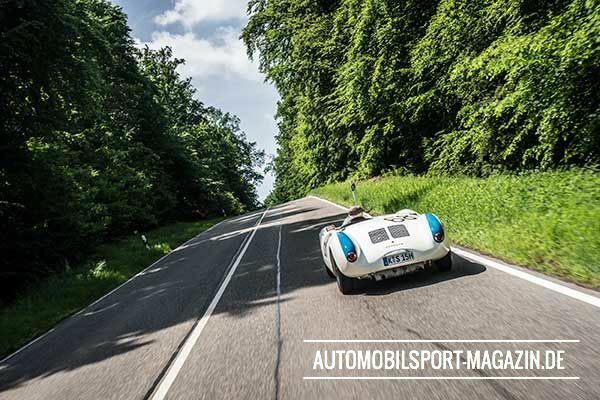 It produced its first handfuls of cars in Austria in 1948 and ‘49. 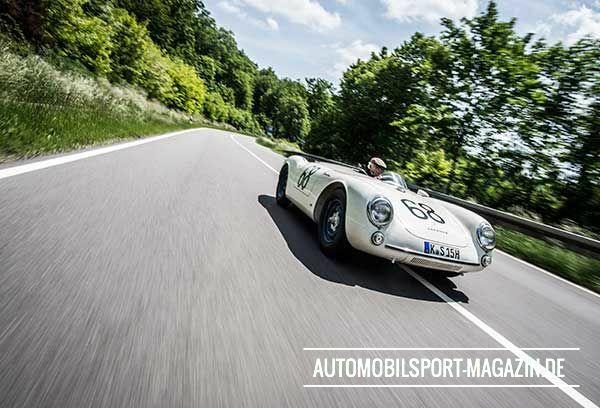 The first German-built Porsche sports car was made in the spring of 1950. 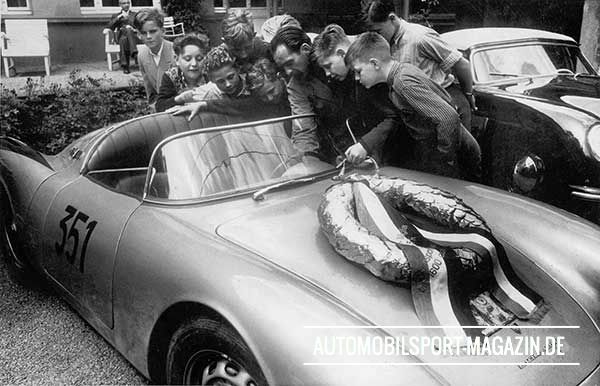 It took the road in good time to be blessed by founder Ferdinand Porsche, who died at the age of 75 in January of 1951. Thereafter his son Ferry, 42 years old in 1951, took charge of the family-owned company. Ferry inherited the outstanding team of engineers that his father assembled when he set up his engineering consulting office in Stuttgart at the end of 1930. 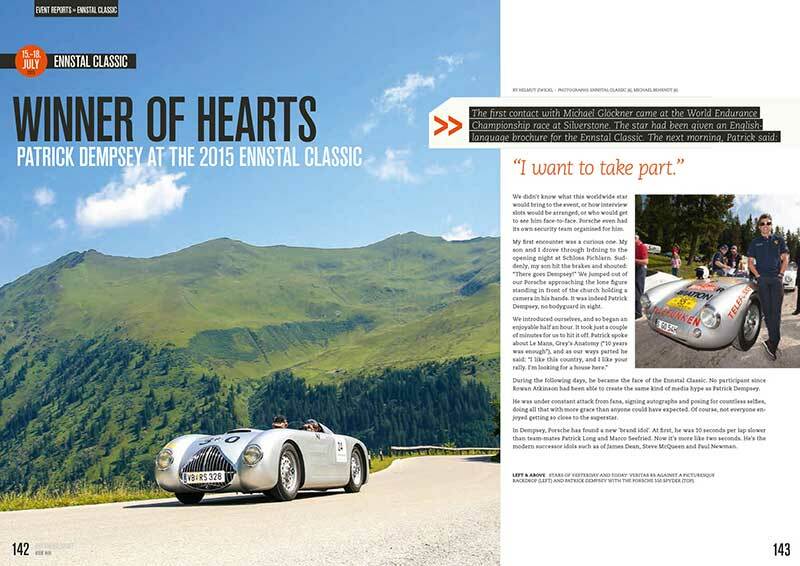 For Ferry and his team, motor sports were high in both interest and priority. 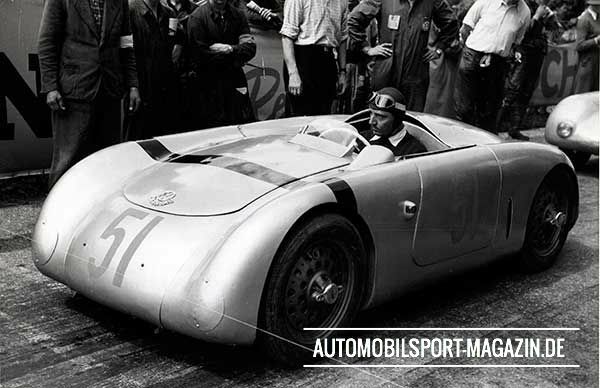 They had designed and helped develop the great Auto Union racing cars of 1934 through 1937. 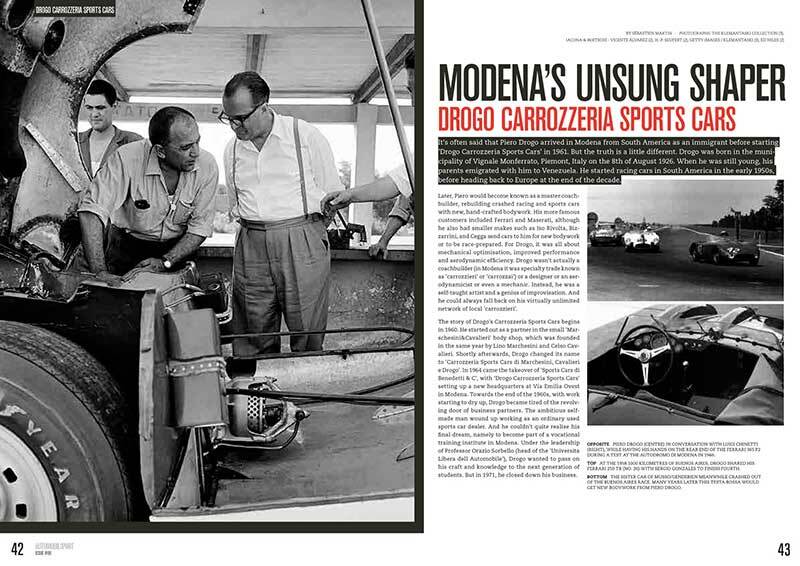 A racing-car project—for Italy’s Cisitalia—put them back on their feet after the war. They weren’t slow to return to the tracks. 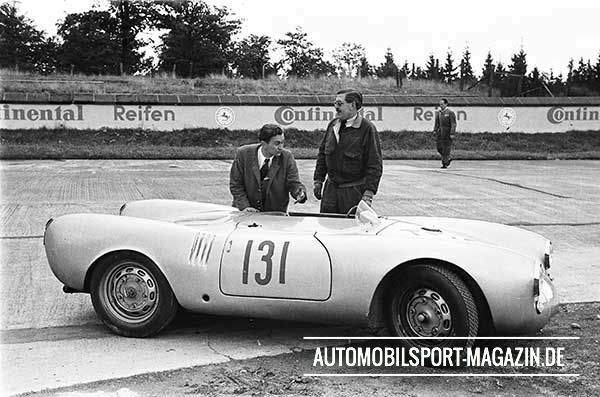 For racing Porsche used its Austrian-built Type 356 coupes, which were lighter with aluminum bodies and stiffer frames than the production cars. 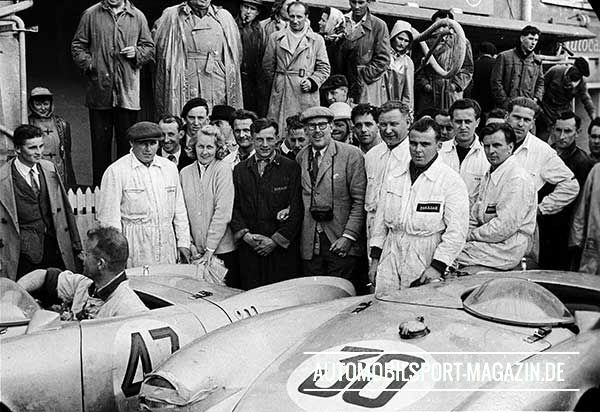 A solo entry in the 24-hour Le Mans race in 1951 came home with the 1,100 cc class victory. 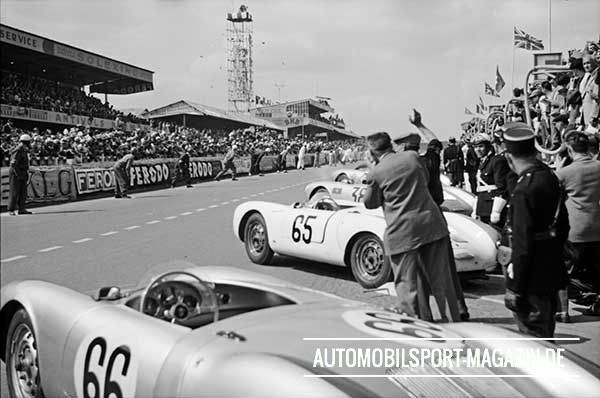 This was followed up with another class win in the world-famous French race in 1952. 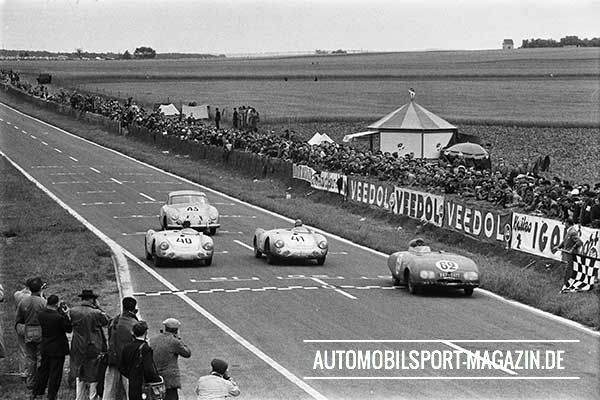 Porsche was in fact a pioneer in returning a chastened Germany to European road racing, from which it was excluded immediately after the years of war. 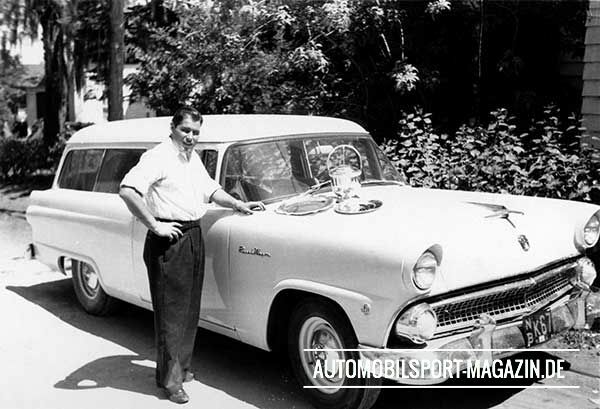 With competition heating up, Ferry and his team realized that they would need to build special cars for racing as early as 1953. They had a convenient example to follow, that of Frankfurt’s Walter Glöckler. A year older than Ferry, Glöckler was a great racing enthusiast who, as a VW dealer, could afford to indulge his passions. 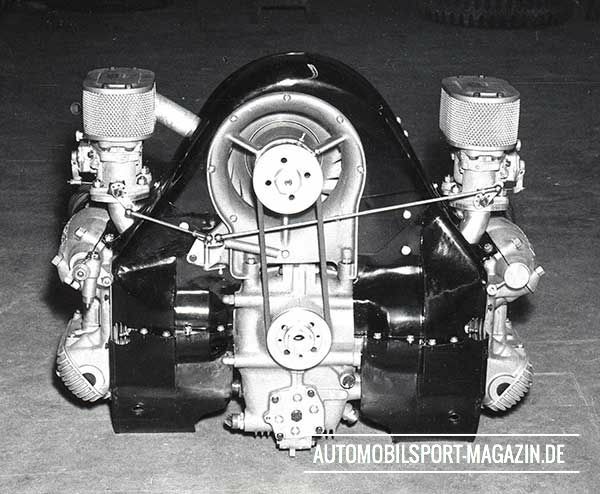 Starting in 1949 he did so with the help of his brilliant workshop chief, Hermann Ramelow, who had worked on the pre-war racing Adlers. 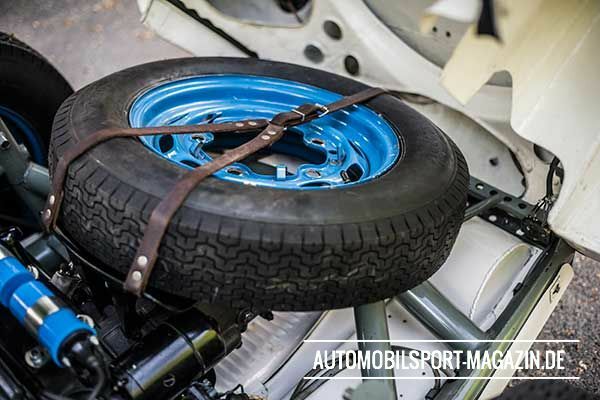 Although using VW suspension, Ramelow replaced the platform with a ladder-type steel tubular frame that was underslung at the rear. 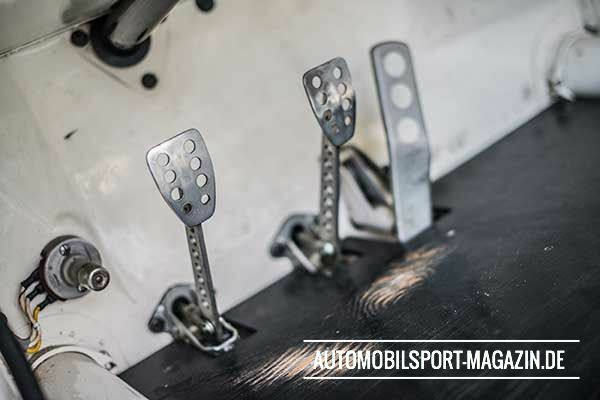 Power came from one of the new 1.1-liter Porsche engines, mounted amidships. The driver’s seat was nearly in the center of the stubby yet handsome aluminum body built by C. H. Weidenhausen of Frankfurt, a three-man outfit that Jerry Sloniger said was “virtually across the street” from the Glöckler dealership. In the 1930s Weidenhausen had built sporting aluminum bodies for V-8 Fords. The finished car bore a deceptively modest name: VW Eigenbau or VW Homebuilt. 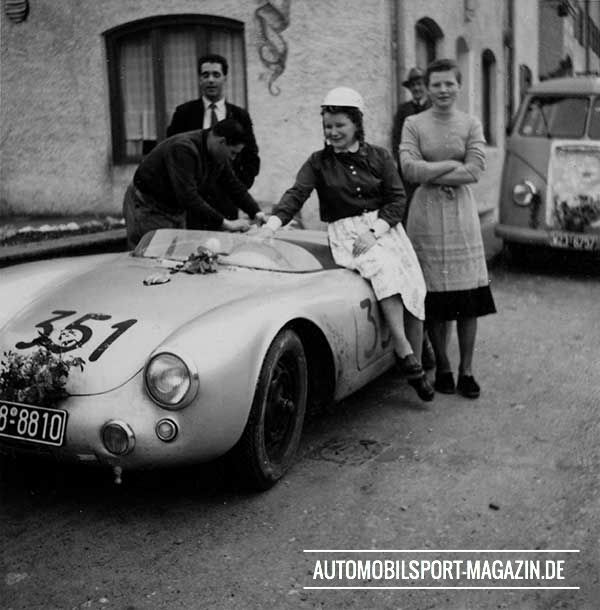 Walter Glöckler drove his 980-pound special to the 1,100 cc sports-car class championship in Germany in 1950. 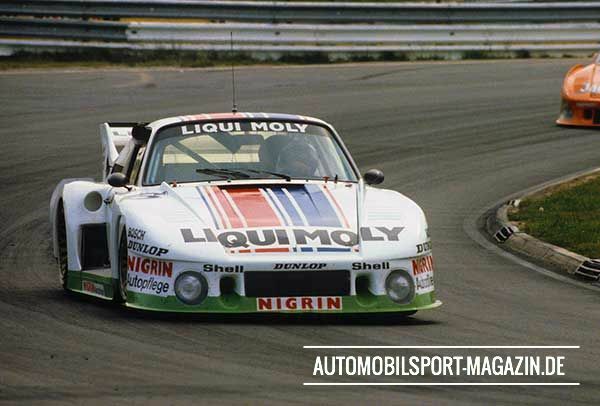 During that season Glöckler improved his relations with the Porsche company, which by then had returned to its Stuttgart-Zuffenhausen home from exile at Gmünd in Austria. 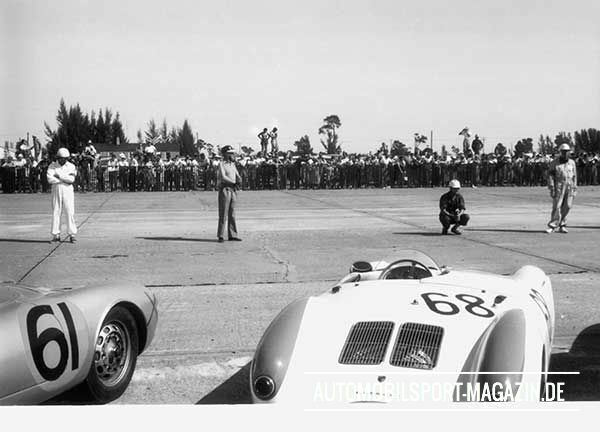 Porsche had come to respect this determined businessman who obviously had a knack for building and racing highly professional cars. The result was two-fold. 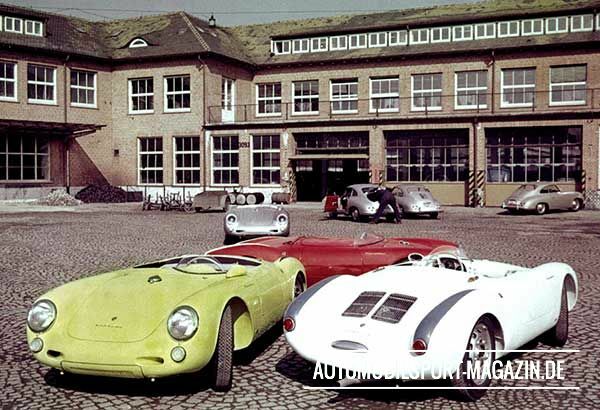 On March 17, 1950 Otto and Walter Glöckler became Germany’s first Porsche dealer in the vital market of Frankfurt. This was just in time for the start of production at Zuffenhausen. 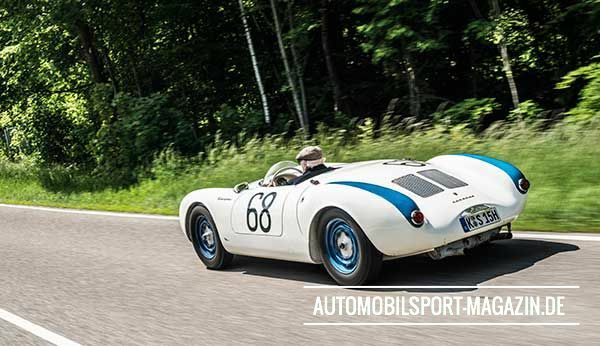 As well, from 1951 all the Glöckler-built cars—of which there were several more for the 1.5-liter class—bore a simple “Porsche” nameplate and were known as Porsches in the press, giving the still-young marque valuable publicity. 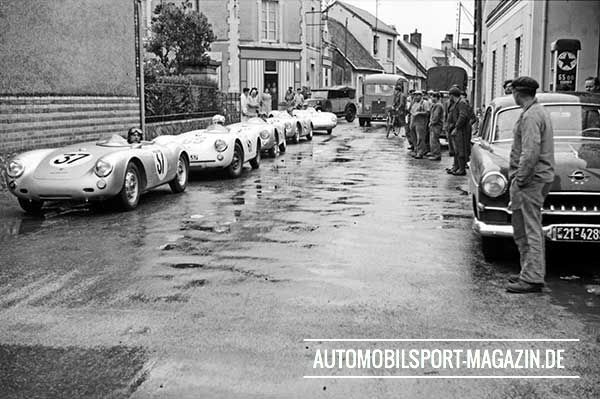 In 1952 Porsche decided to design and build new competition cars to replace its faithful but aging Gmünd-built coupes. 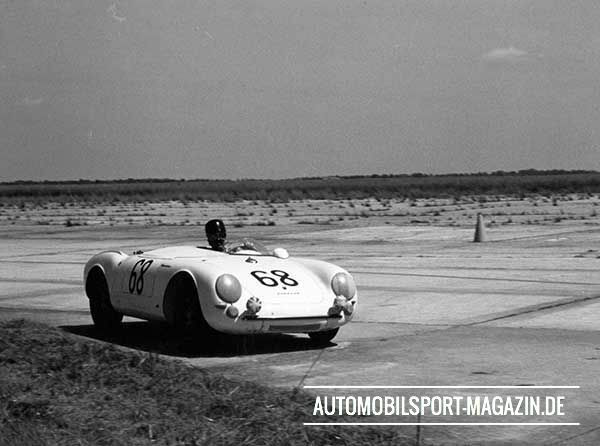 This was a new venture for Ferry Porsche and his business manager Albert Prinzing. Extending the company’s activities into a new arena brought both added cost and risk. 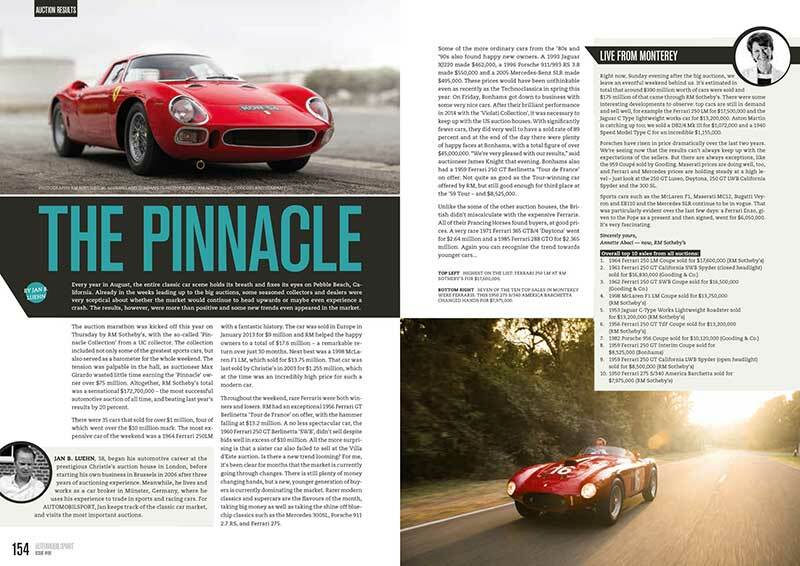 Ferry surely rationalized that if one of his dealers could afford to build and enter racing cars, doing so should not be beyond his company’s capabilities. As was his style, however, Ferry explored this new enterprise prudently. 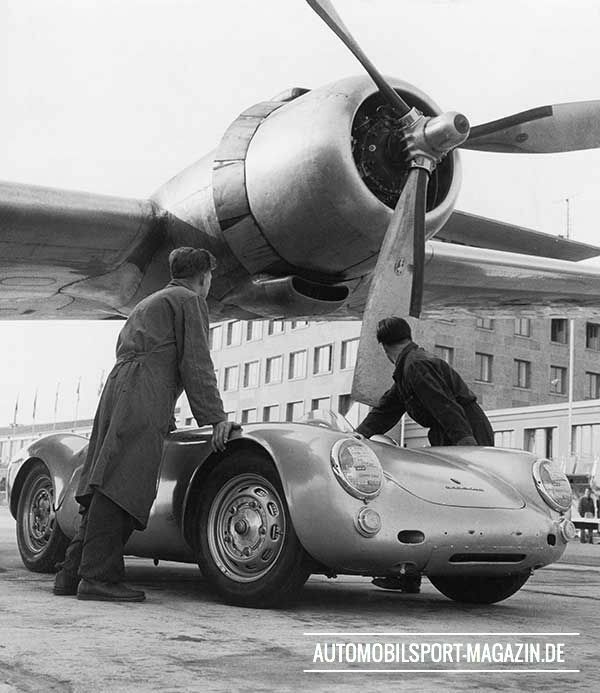 Ferry Porsche knew that racing, both by the factory and by private owners, had enhanced the reputation and sales of his cars. 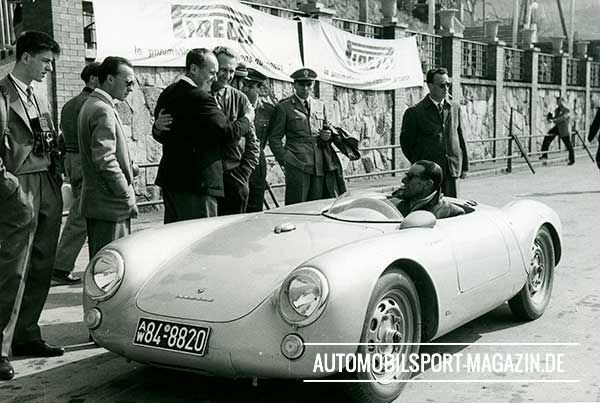 Racing had also gained a powerful new advocate within the Porsche organization from mid-1951: Fritz Huschke Sittig Enno Werner von Hanstein, usually known simply as Huschke. Mad keen on motoring of all kinds, von Hanstein had raced both motorcycles and cars before the war. 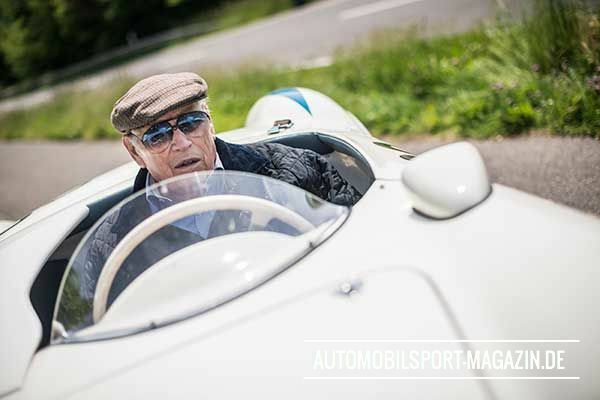 He was German hill-climb champion in a BMW 328 and co-drove the winning BMW coupe in the 1940 Mille Miglia. Huschke raced after the war as well. 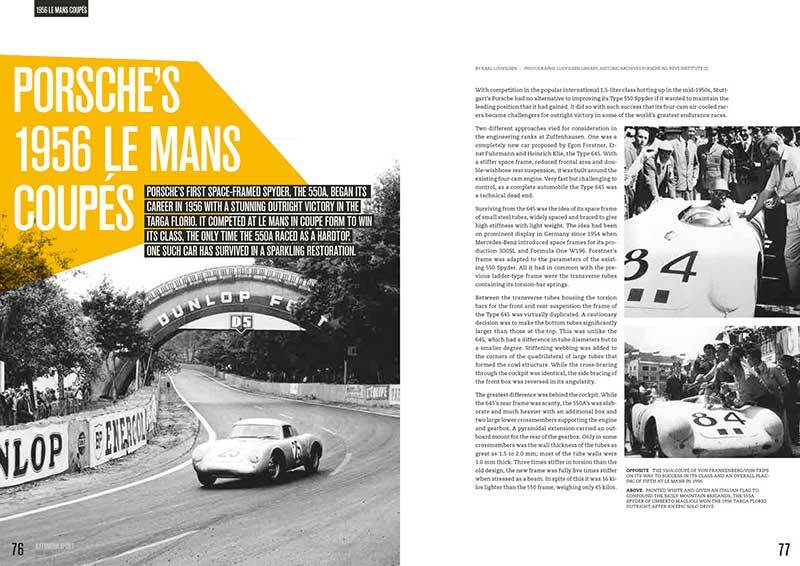 He was only ousted from the cockpit of one of the 550s at Le Mans in 1953 because Ferry Porsche thought he was better employed in the pits, managing the team. 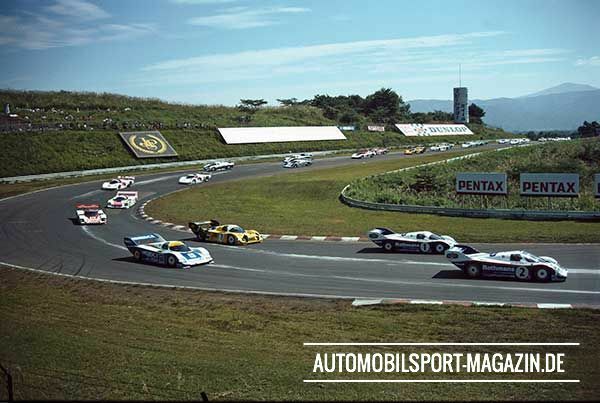 Heading both press relations and racing for Porsche, von Hanstein became to Porsche what Alfred Neubauer was to Daimler-Benz: the resident representative of the spirit of motor racing. He was the bright spark behind the successful commercialization of the company’s on-track activities. 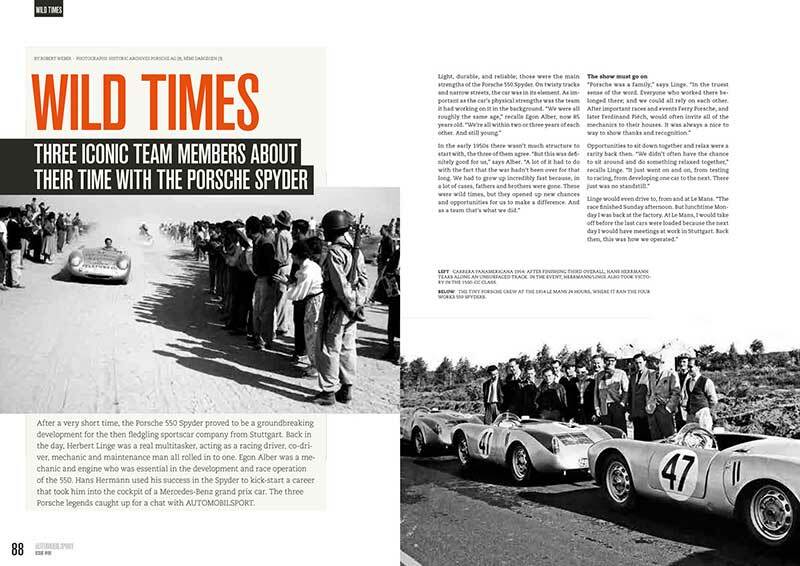 By mid-1952 von Hanstein and others at Porsche could see the handwriting on the wall for their budding reputation in the racing world. 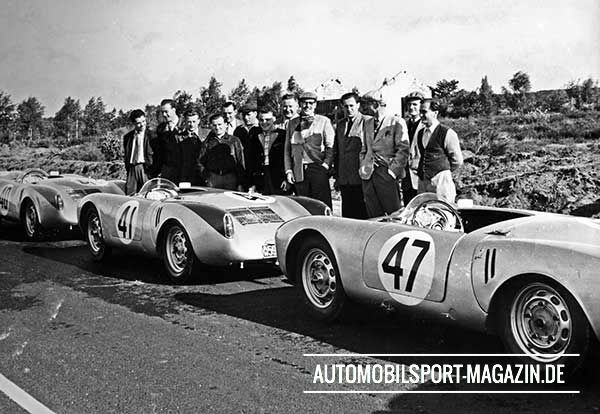 In the 1,100 cc class, where Porsches had been so successful at Le Mans, Italy’s OSCA presented a formidable new threat with its purebred racing engines. 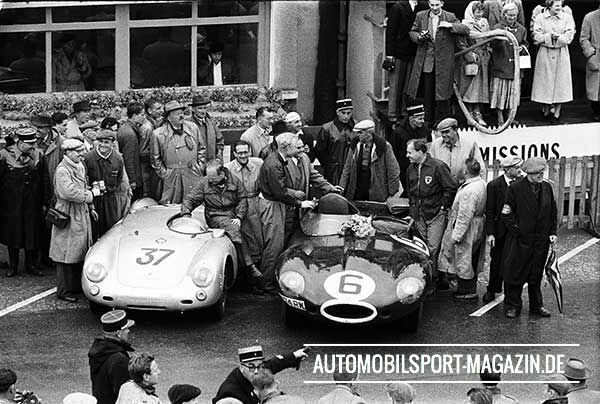 OSCA was also beginning to invade the 1,500 cc class, won at Le Mans that year by a British Jowett Jupiter. 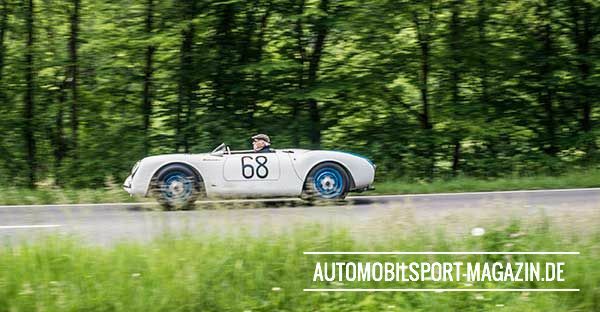 In Germany, meanwhile, Borgward and the East Zone’s EMW were presenting strong opposition in the 1.5-liter class. 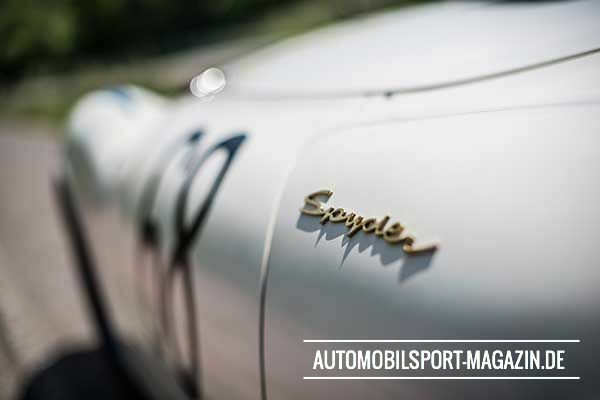 Against this improving competition, Porsche could no longer rely on modified and lightened versions of its production cars. 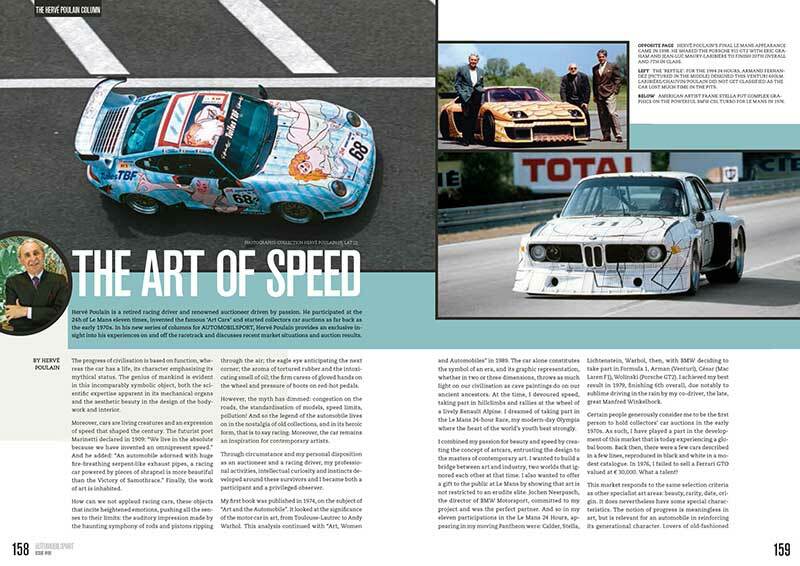 If it were to defend its laurels it needed something better suited to racing. “Ferry Porsche once said 'I can come to you any time I want. It doesn't matter if it is day or night, Saturday or Sunday, there is always someone here'. It had to be that way. 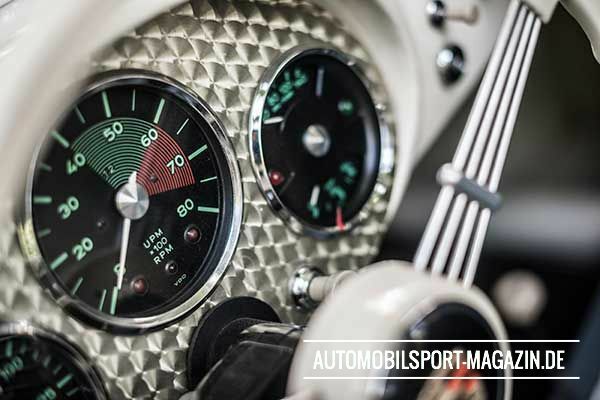 In that time, as Porsche was growing – maybe even celebrating the production of our 500th car, other manufacturers like Veritas and Borgward were closing down. When Ferry Porsche told us in a critical hour that he wasn't sure if things could carry on, we just carried on. And we made it all carry on. 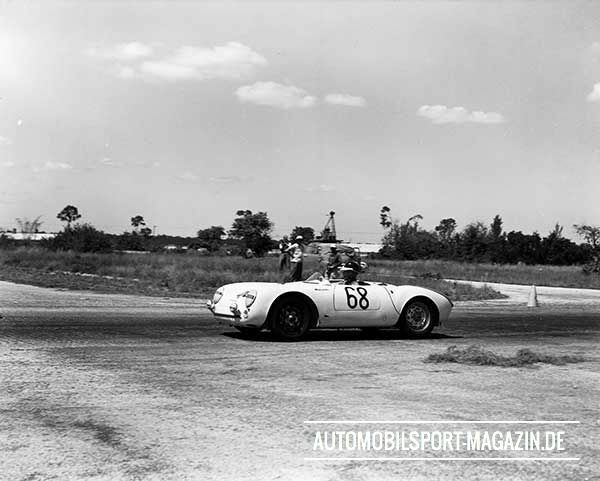 60 years ago, Herbert Linge and Huschke von Hanstein came in eighth overall at the 12 Hours of Sebring and took second place in the 1500 ccm class with a Porsche 550 Spyder. 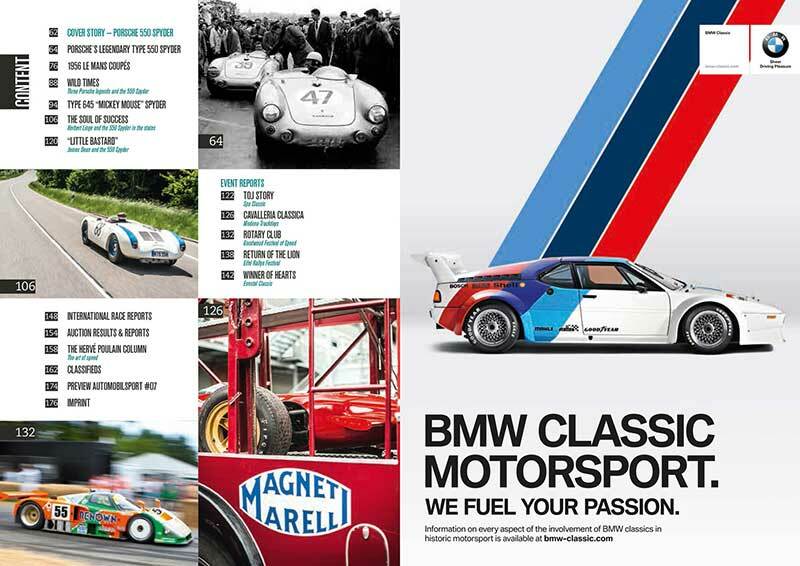 Back then, the race poster celebrating the triple class victory (1100, 1300 and 1600 ccm) and the winning of the team trophy declared “8 Porsches start – 7 finish”. 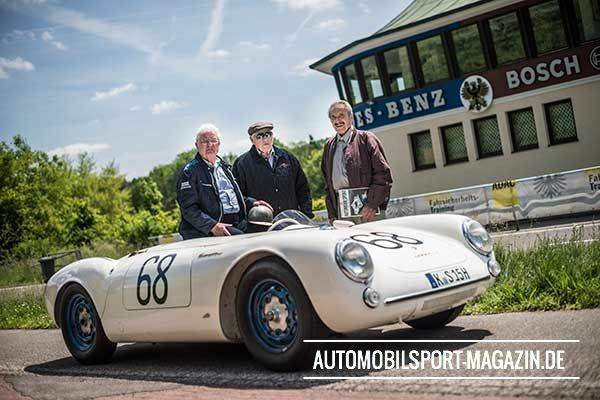 AUTOMOBILSPORT brought Herbert Linge’s Sebring car back to Stuttgart, to the Solitude Ring, and sat the former driver of the legendary 550 Spyder behind the wheel one more time. 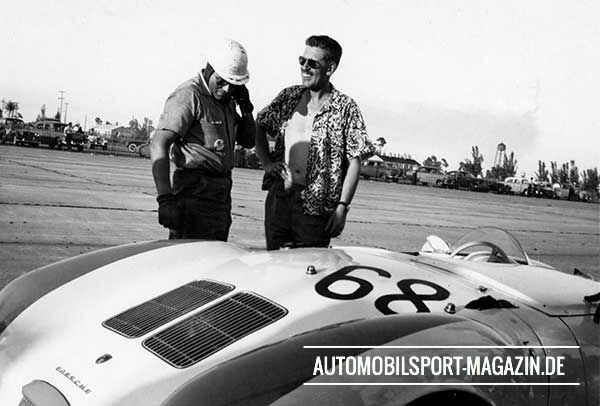 Born in Weissach, not far from Stuttgart, he later made a major contribution to motorsport as the initiator of the ONS-Sicherheitsstaffel (ONS Safety Squad) and was a co-founder of the Porsche Development Centre in his hometown. 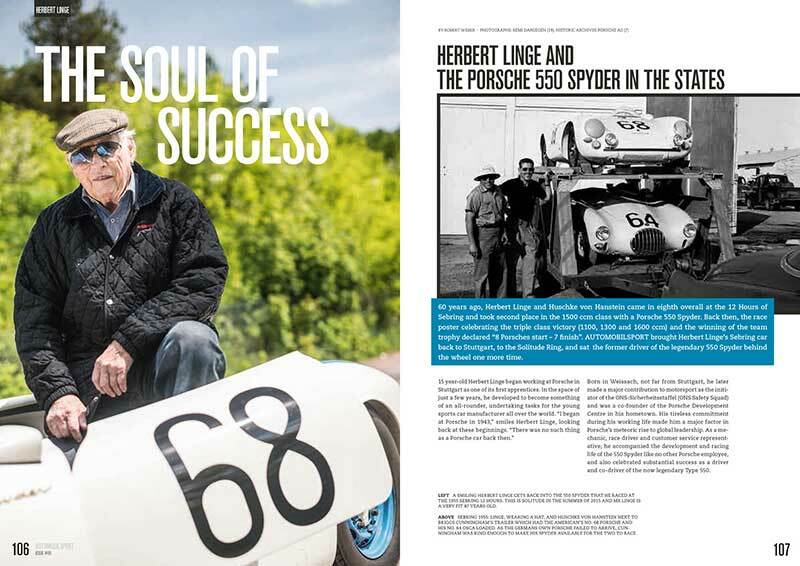 His tireless commitment during his working life made him a major factor in Porsche’s meteoric rise to global leadership. 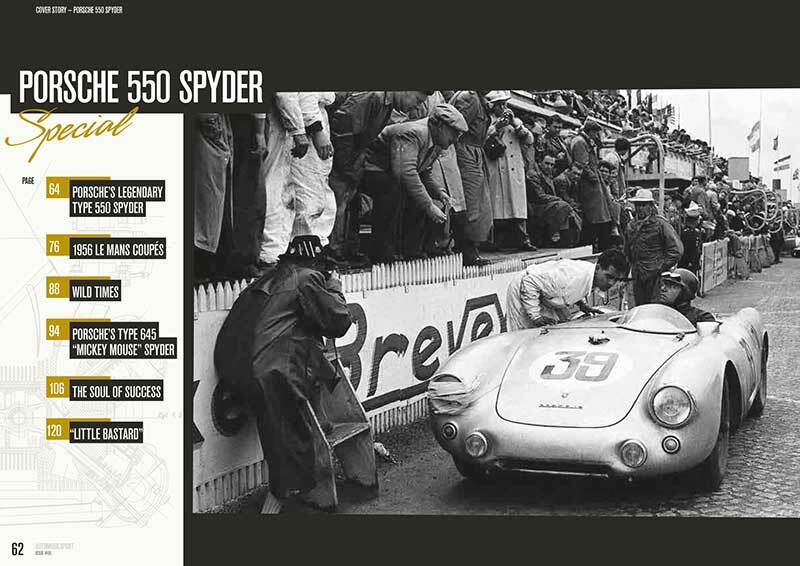 As a mechanic, race driver and customer service representative, he accompanied the development and racing life of the 550 Spyder like no other Porsche employee, and also celebrated substantial success as a driver and co-driver of the now legendary Type 550. 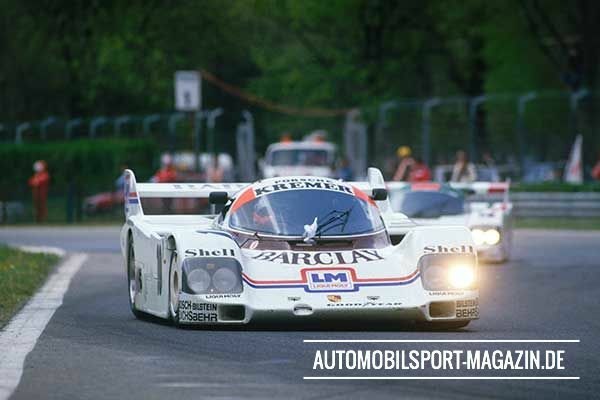 Thirty years ago, on 01 September 1985, motor racing was robbed on one of its most exciting young drivers, when 27 year old German Stefan Bellof crashed his Porsche 956 at Spa. 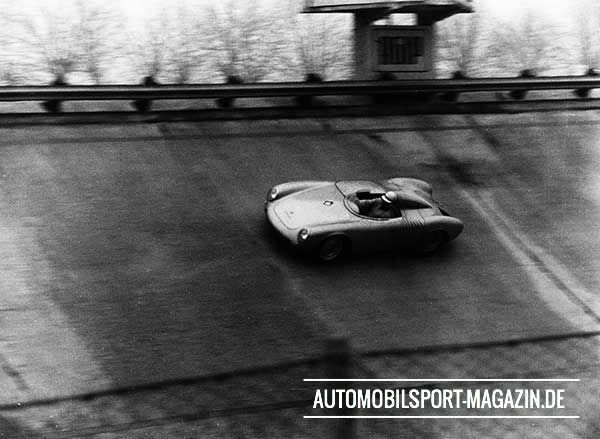 The accident occurred as he was attempting a typically audacious overtaking move at the infamous Eau Rouge corner. 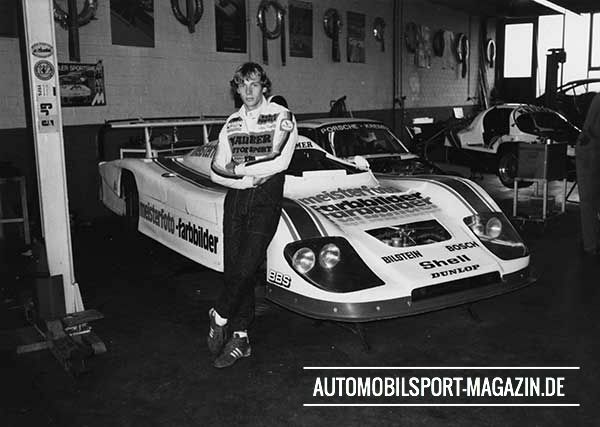 In only his fifth season of racing, Bellof had already established himself as a man with a rare talent. The real tragedy of his death was that he had not had the opportunity to express himself in Grand Prix terms, having made just 20 starts for the fading Tyrrell team. 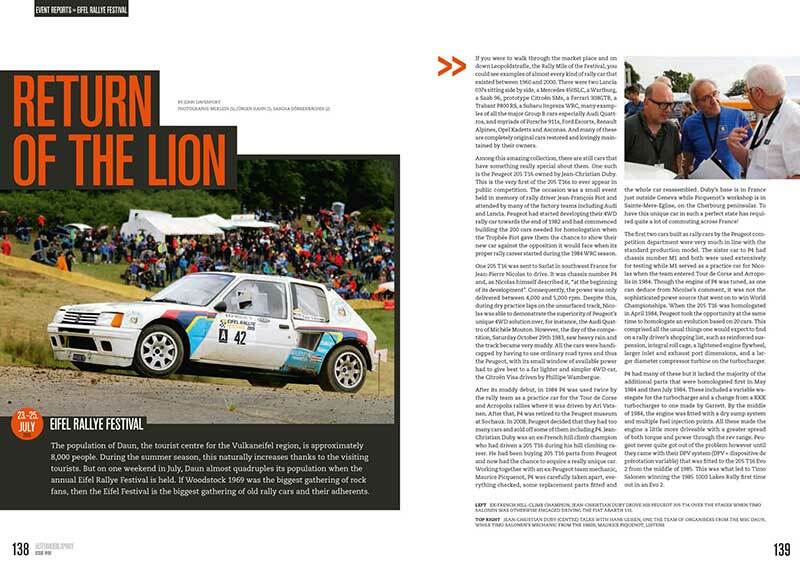 Stefan was a raw talent, a little in-disciplined maybe, but an instinctive racer, and naturally very, very fast. 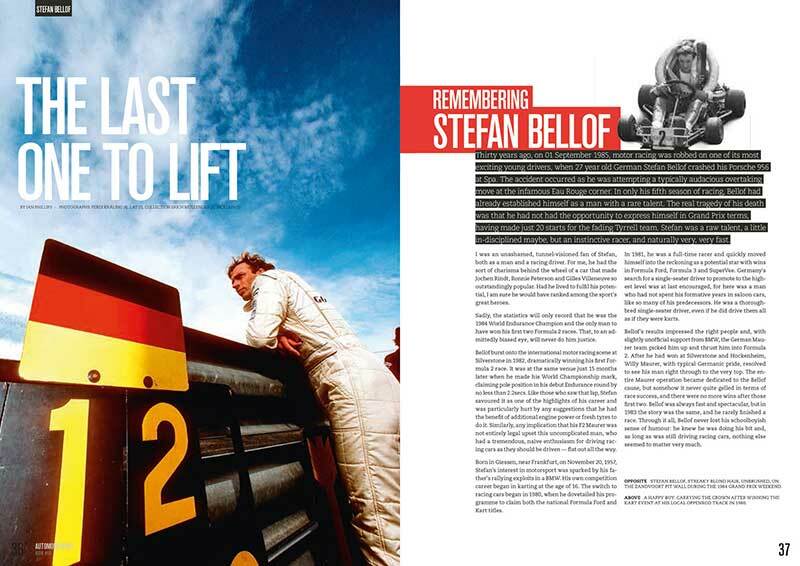 I was an unashamed, tunnel-visioned fan of Stefan, both as a man and a racing driver. For me, he had the sort of charisma behind the wheel of a car that made Jochen Rindt, Ronnie Peterson and Gilles Villeneuve so outstandingly popular. Had he lived to fulfil his potential, I am sure he would have ranked among the sport's great heroes. Sadly, the statistics will only record that he was 1984 World Endurance Champion and the only man to have won his first two Formula 2 races. That, to an admittedly biased eye, will never do him justice. Bellof burst onto the international motor racing scene at Silverstone in 1982, dramatically winning his first Formula 2 race. 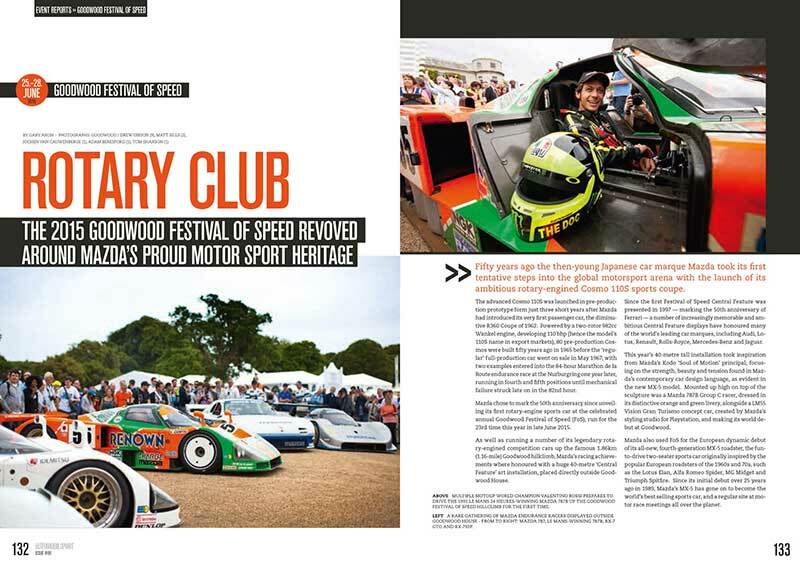 It was at the same venue just 15 months later when he made his World Championship mark, claiming pole position in his debut Endurance round by no less than 2.2secs. Like those who saw that lap, Stefan savored it as one of the highlights of his career and was particularly hurt by any suggestions that he had the benefit of additional engine power or fresh tyres to do it. 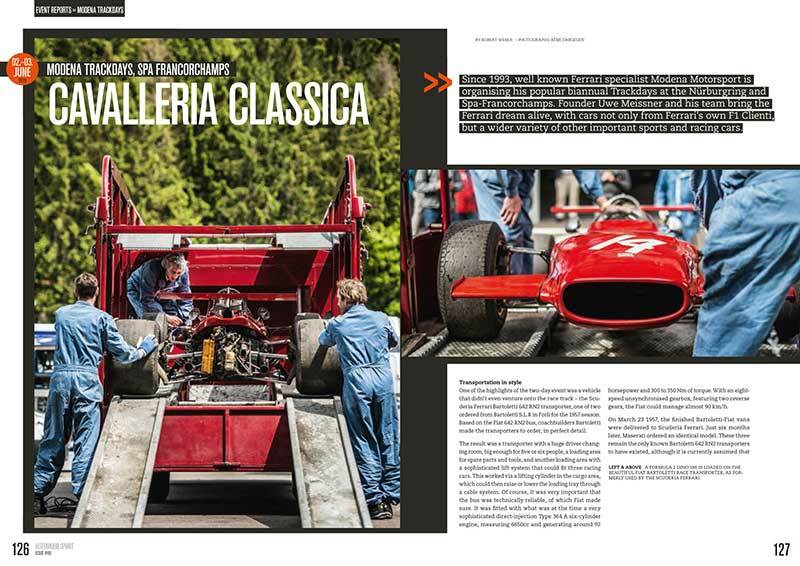 Similarly, any implication that his F2 Maurer was not entirely legal upset this uncomplicated man, who had a tremendous, naive enthusiasm for driving racing cars as they should be driven — flat out all the way. 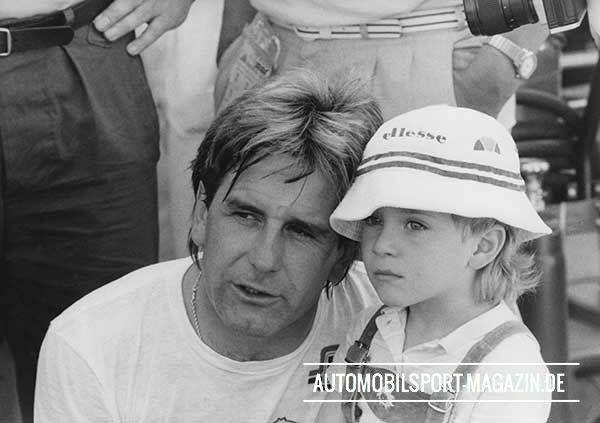 Born in Giessen, near Frankfurt, on November 20, 1957, Stefan's interest in motorsport was sparked by his father's rallying exploits in a BMW. 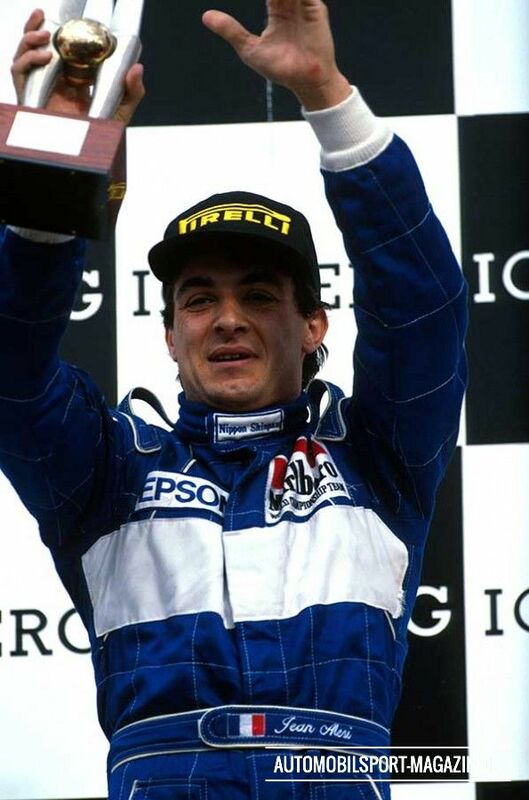 His own competition career began in karting at the age of 16. The switch to racing cars began in 1980, when he dovetailed his programme to claim both the national Formula Ford and Kart titles. 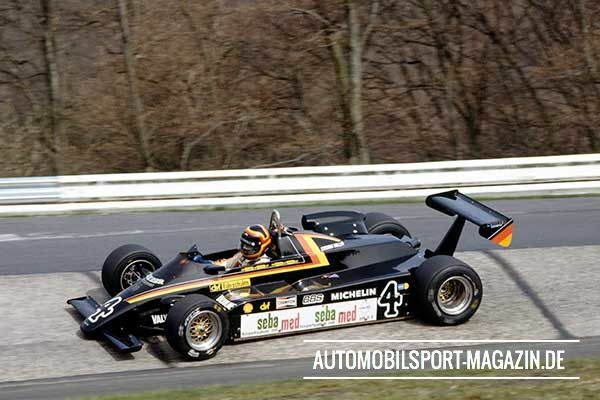 In 1981, he was a full-time racer and quickly moved himself into the reckoning as a potential star with wins in Formula Ford, Formula 3 and SuperVee. Germany's search for a single-seater driver to promote to the highest level was at last encouraged, for here was a man who had not spent his formative years in saloon cars, like so many of his predecessors. 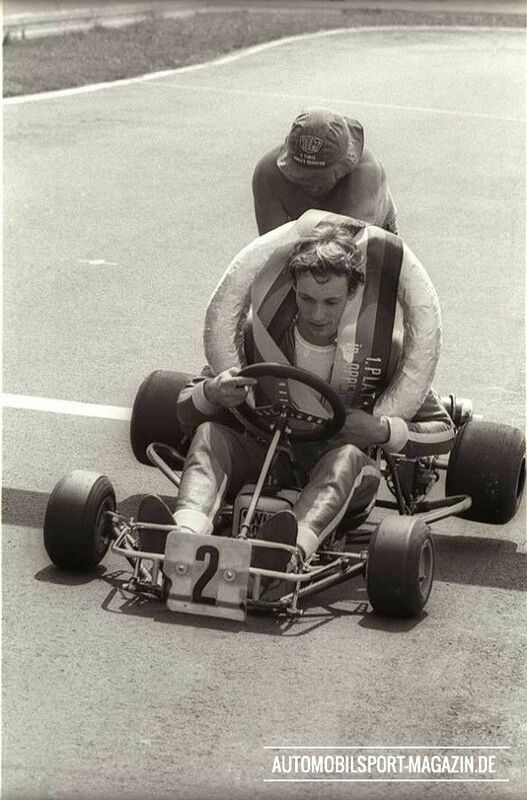 He was a thoroughbred single-seater driver, even if he did drive them all as if they were karts. Bellofs results impressed the right people and, with slightly unofficial support from BMW, the German Maurer team picked him up and thrust him into Formula 2. 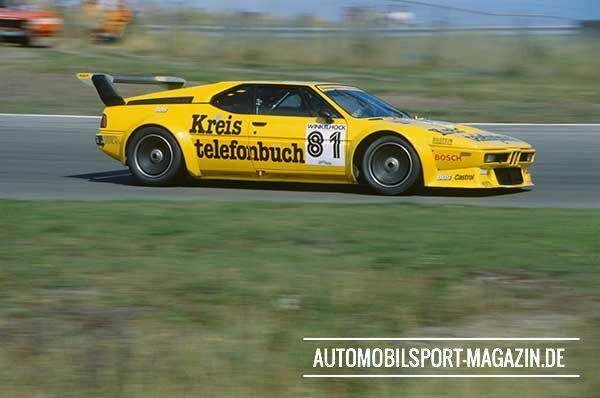 After he had won at Silverstone and Hockenheim, Willy Maurer, with typical Germanic pride, resolved to see his man right through to the very top. 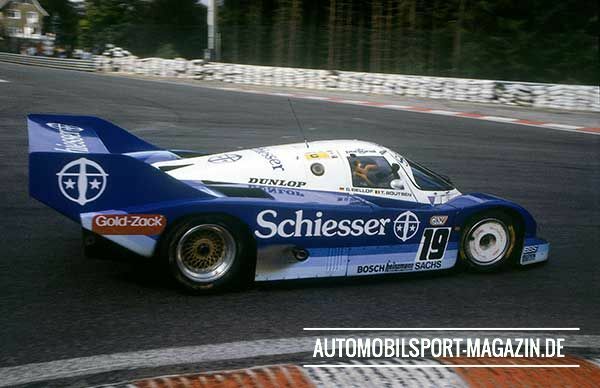 The entire Maurer operation became dedicated to the Bellof cause, but somehow it never quite gelled in terms of race success, and there were no more wins after those first two. 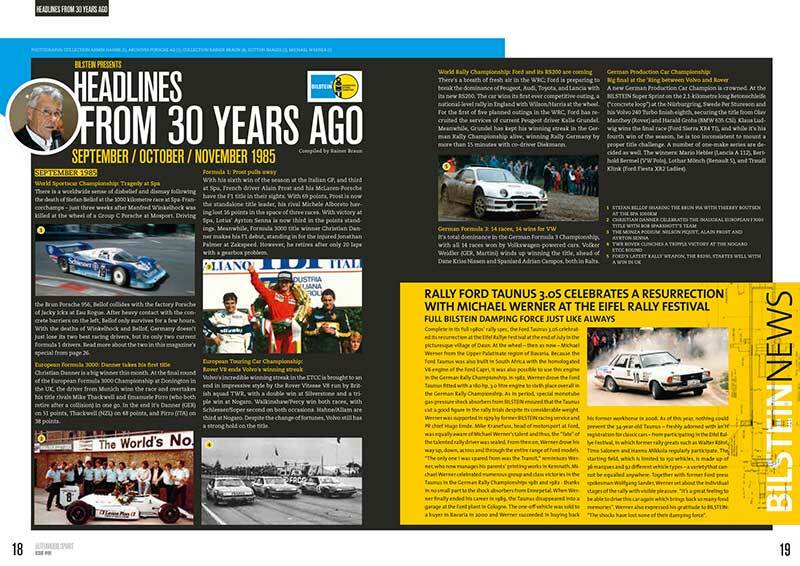 Bellof was always fast and spectacular, but in 1983 the story was the same, and he rarely finished a race. 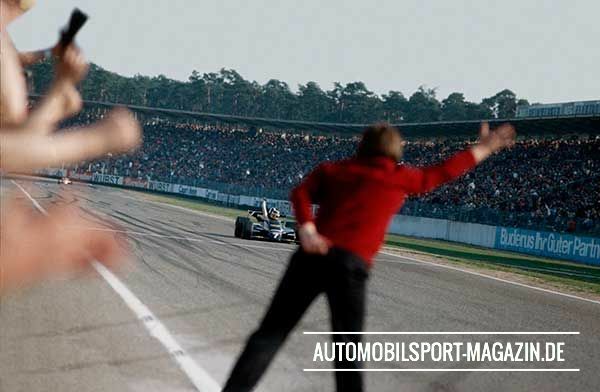 Through it all, Bellof never lost his schoolboyish sense of humour: he knew he was doing his bit and, as long as was still driving racing cars, nothing else seemed to matter very much. 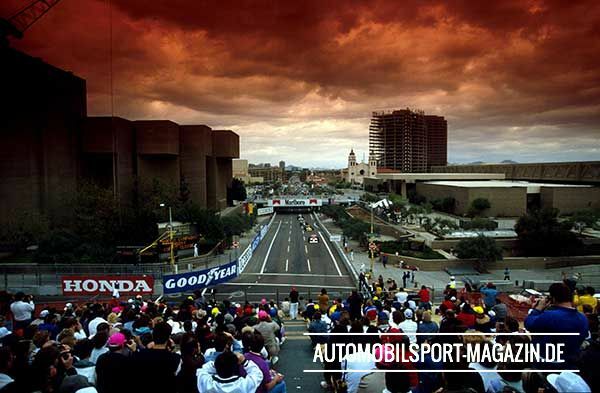 The first Grand Prix of the 1990’s was held in the city of Phoenix, at a street circuit that could hardly be considered a classic race track. 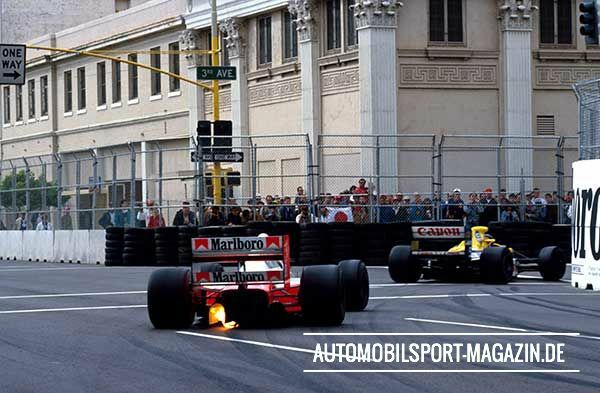 Nonetheless, 25 years ago the Arizona State Capital gave us one of the most exiting F1 season openers of all time. 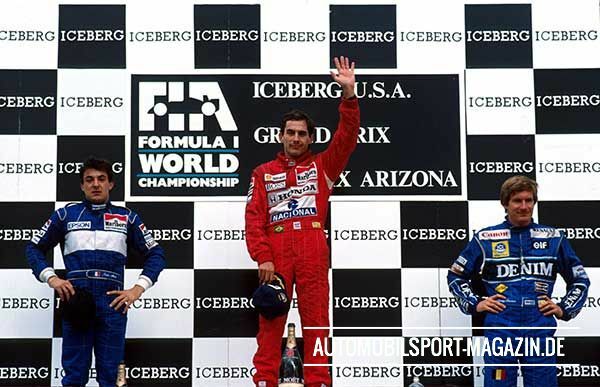 McLaren and Ferrari were expected to dominate, but in Phoenix several underdogs shook the establishment: A Minardi would start from the front row, with a Dallara and a Tyrrell right behind! 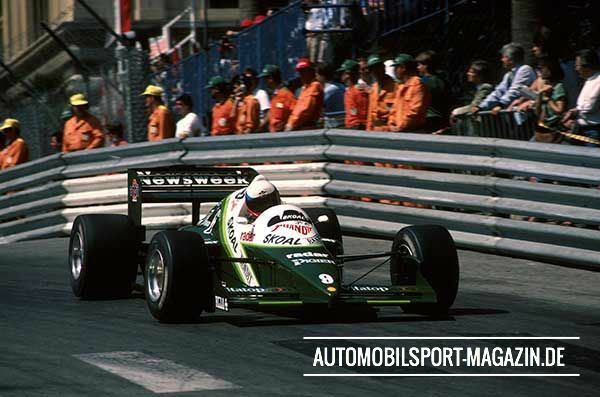 In the race, the nimble Tyrrell with an ambitious young Frenchman at the wheel was the one to watch. 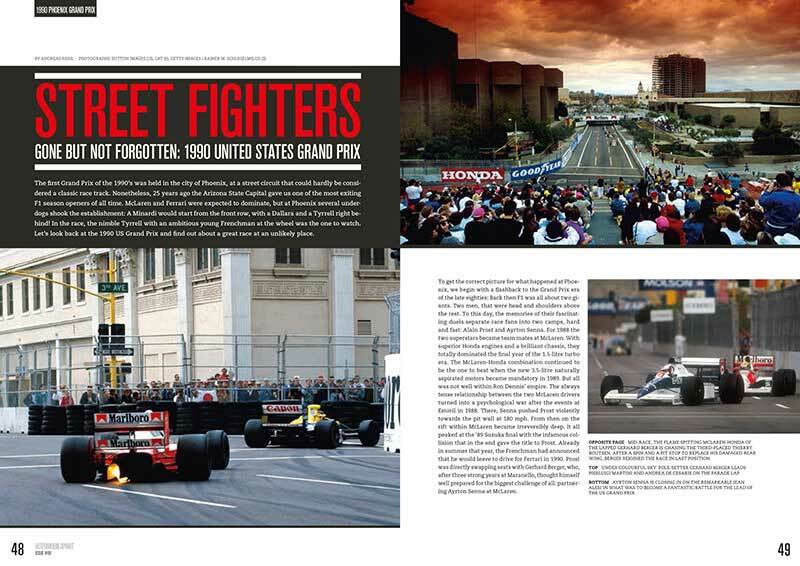 Let’s look back at the 1990 US Grand Prix and find out about a great race at an unlikely place. To get the correct picture for what happened at Phoenix, we begin with a flashback to the Grand Prix era of the late eighties: Back then F1 was all about two giants. Two men, that were head and shoulders above the rest. 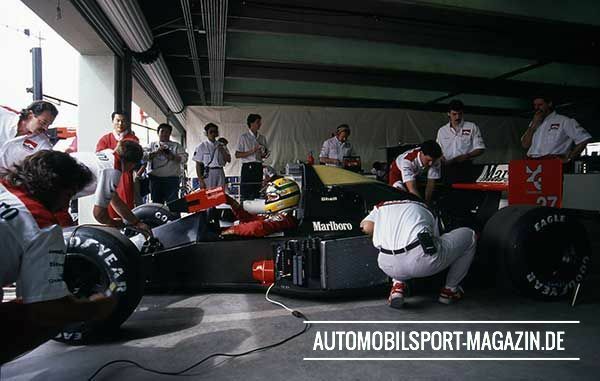 To this day, the memories of their fascinating duels separate race fans into two camps, hard and fast: Alain Prost and Ayrton Senna. For 1988 the two superstars became team mates at McLaren. 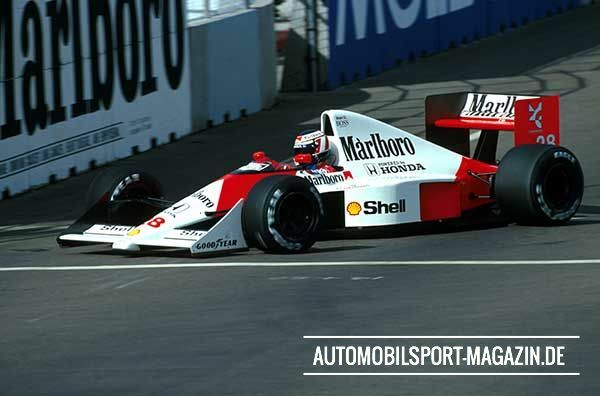 With superior Honda engines and a brilliant chassis, they totally dominated the final year of the 1.5-litre turbo era. The McLaren-Honda combination continued to be the one to beat when the new 3.5-litre naturally aspirated motors became mandatory in 1989. But all was not well within Ron Dennis’ empire. The always tense relationship between the two McLaren drivers turned into a psychological war after the events at Estoril in 1988. There, Senna pushed Prost violently towards the pit wall at 180 mph. From then on the rift within McLaren became irreversibly deep. It all peaked at the ’89 Suzuka final with the infamous collision that in the end gave the title to Prost. Already in summer that year, the Frenchman had announced that he would leave to drive for Ferrari in 1990. Prost was directly swapping seats with Gerhard Berger, who, after three strong years at Maranello, thought himself well prepared for the biggest challenge of all: partnering Ayrton Senna at McLaren. F1 had shuffled its cards well for the new season. Everyone was curious about how the reigning champion Alain Prost would settle in at Ferrari, where he’d team up with the hard charging Nigel Mansell. During pre-season testing the new Ferrari 641 looked strong and much closer to McLaren than before. There, newcomer Gerhard Berger did most of the test mileage. Ayrton Senna stayed in Brazil for the winter months and only turned up for the final pre-season runs. Berger established himself well within his new team and was soon setting competitive lap times. If Gerhard’s one-lap pace was never in doubt, a question mark still remained over his consistency and weather he would be able to deliver on Senna’s level for the duration of a full season. The tall Austrian also had trouble fitting in the tight McLaren chassis. Problems with a poor seating position would accompany Berger all year, unfortunately not without affecting his performance. If anyone would be able to compete with McLaren and Ferrari, it was thought to be Williams. The team from Grove was now in the second year with Renault V10 engines and the Williams FW13B showed promising speed in the hands of Riccardo Patrese and Thierry Boutsen. Benetton, exclusively using the narrow-angle works Ford HB V8 and having freshly recruited Nelson Piquet and designer John Barnard, was considered an outside bet. Ranking behind the big four teams, pre-season testing predicted a very substantial and competitive midfield. The Lamborghini V12-powerd Lotus and Larrousse-Lola were mixing it with the Judd-engined Leyton House and Brabham as well as the customer Ford DFR teams of Tyrrell, Ligier, Arrows, Minardi, Dallara, Osella, and Onyx. 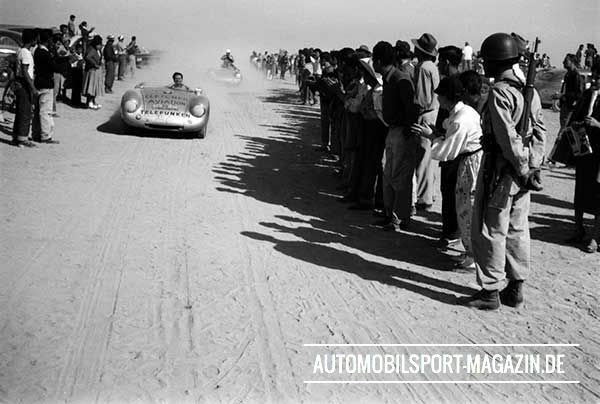 At the tail end of the field we had the French AGS squad, Walter Brun’s EuroBrun and two very exotic designs, both from Italy, and both powered by unconventional 12-cylinder engines: The Coloni-Subaru and Ernesto Vita’s bizarre Life. 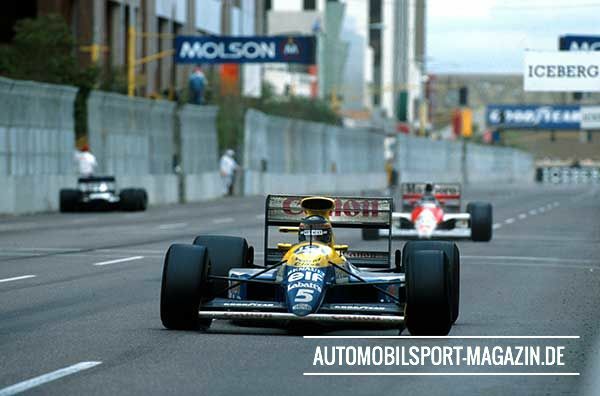 And so in early March 1990 the Grand Prix circus arrived at Phoenix to start the new season. In an attempt to avoid the summer heat of the scorching Arizona dessert, which affected the inaugural Phoenix race in the previous July, the event was now moved to the beginning of the F1 calendar. On a cool and overcast Friday morning 9 out of the 33 strong entries had the track from 8:00 to 9:00 to themselves to pre-qualify, with only the quickest four allowed to continue. Of the early risers, Roberto Moreno surprised by setting the fastest time. The Brazilian impressively threw around the inferior EuroBrun half a second quicker than Eric Bernard in his considerably superior Larrousse. The other two that made it through pre-qualifying were Olivier Grouillard in the Osella and Bernard’s team mate Aguri Suzuki. 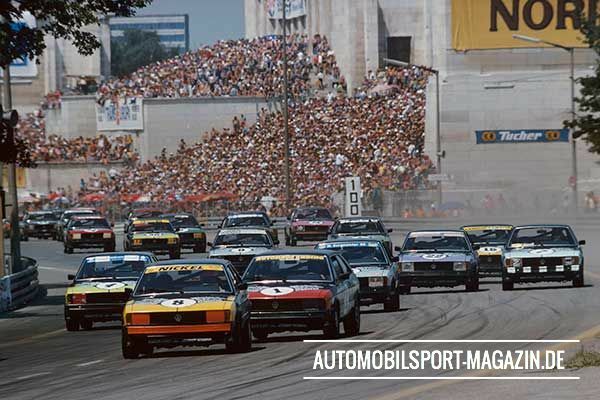 Out and missing the cut by 2sec were both AGS’s of Tarquini and Dalmas, Claudio Langes in the second EuroBrun as well as the hopelessly off-the-pace Life with a frustrated Gary Brabham at the wheel. At least the Australian managed four slow laps before his W12 engine stopped with ECU failure. 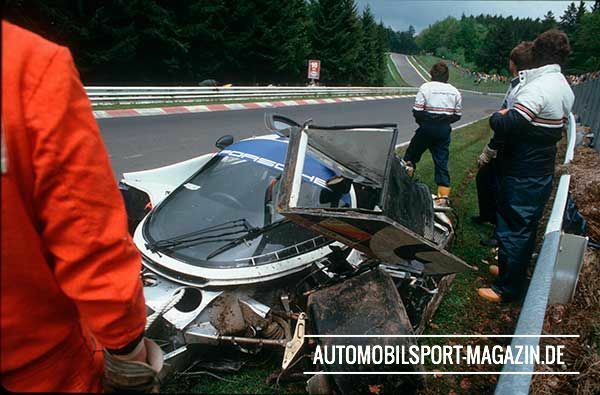 Meanwhile poor Bertrand Gachot’s weekend was already over minutes after the session had started. The Belgian had the gear linkage of his Coloni-Subaru breaking when he accelerated the beautifully sounding but vastly overweight flat-12 out of the pits. Later in the morning, free practice was on and the four survivors of pre-qualifying joined the rest of the field. The session had several accidents, with the concrete barriers next to the track not leaving room for any mistakes. There were no less than four red flags due to a blocked track, a total delay of 54 minutes and many damaged cars. 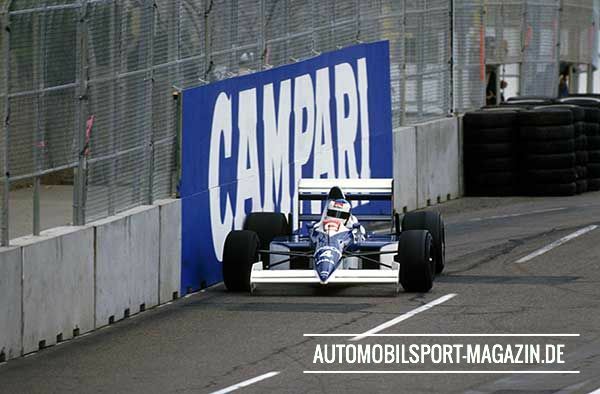 Of the ones that did not end up in the wall, the session held a major surprise on top of the time sheets: Jean Alesi in the Tyrrell set the quickest time! Until then, no one had Ken Tyrrell’s team on the list of potential front runners. To make the Tyrrell performance even more spectacular, his team mate Saturo Nakajima finished the session in fifth. 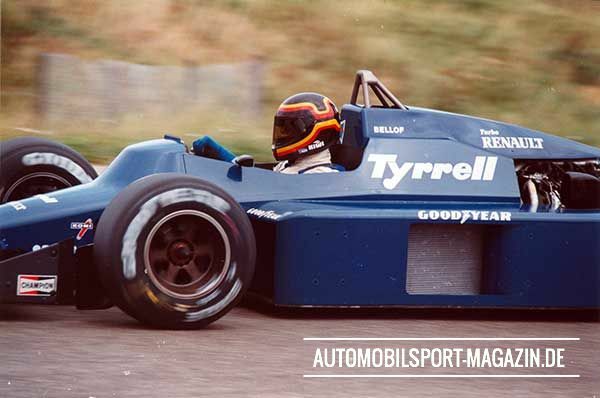 Earlier in the week Ken Tyrrell had announced a sudden switch to Pirelli tyres for his team. 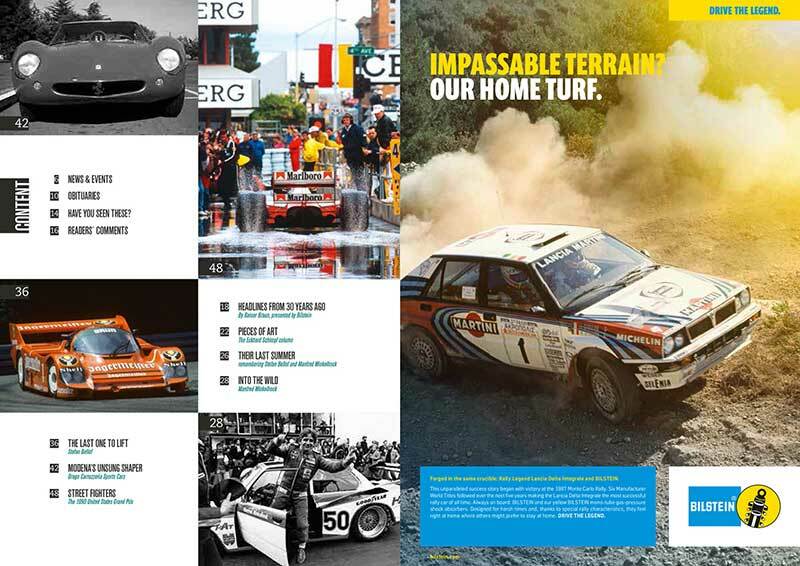 Typically not up to the performance of the superior Goodyear rubber, Pirelli had made huge steps in the second half of 1989. Especially when it came to tracks that favoured softer compounds, Pierluigi Martini in the Minardi impressively ran at the front on several occasions, clearly benefitting from the Pirelli’s efficiency. 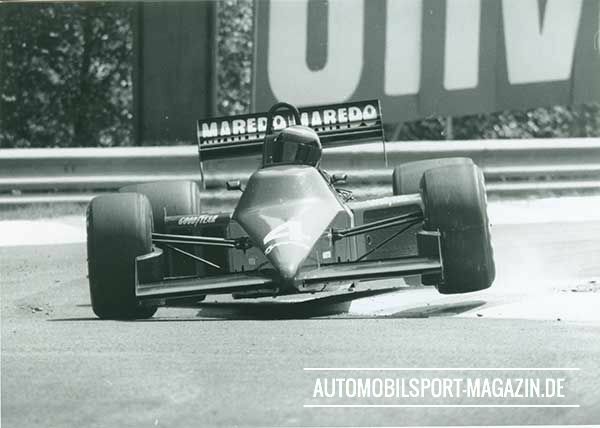 Still, Tyrrell’s late switch of tyre supplier for the new season came unexpectedly, as the team did all its winter testing with Goodyear. Despite its unfamiliarity with the Pirellis, Ken Tyrrell’s outfit got it right and immediately produced a set-up that made the tyres work perfectly at the Phoenix track. On Friday morning Alesi and Nakajima were only split by the McLaren duo and Alain Prost’s Ferrari. The Top 10 in free practice were completed by Piquet’s Benetton, both Williams, Pierluigi Martini in the Minardi (also on Pirellis), and Phillip Alliot’s Ligier. He loved everything that moved fast, particularly if he felt it could give him a sense of freedom. 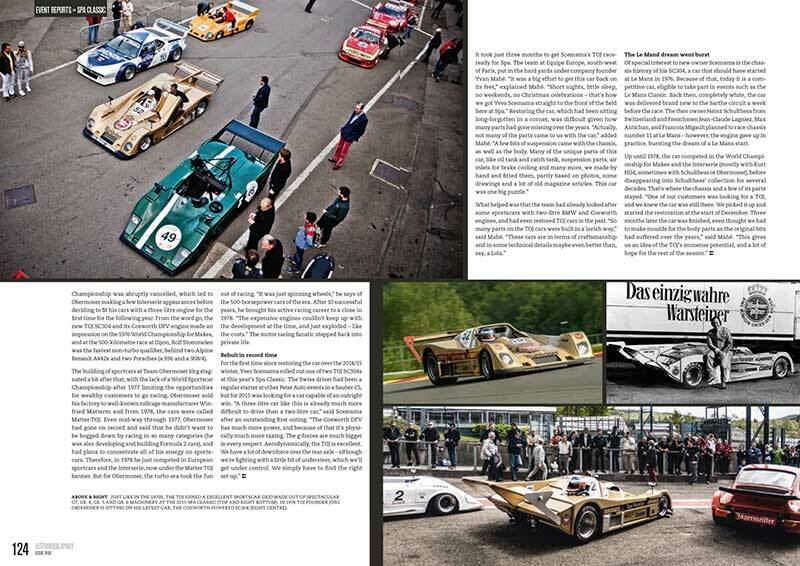 Touring cars, Formula 2, Formula 1, surf boards, catamarans, bikes, big and powerful sportscars. 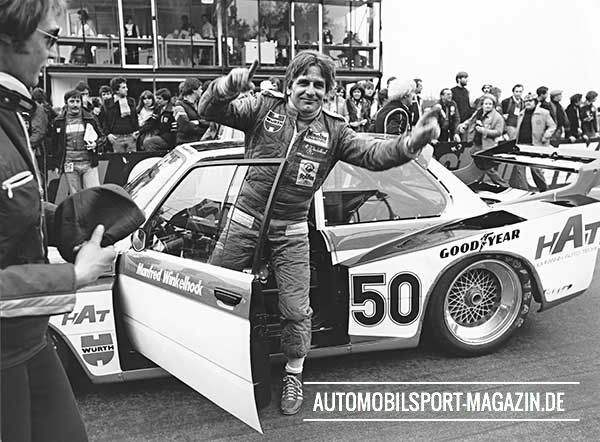 30 years ago, Manfred Winkelhock paid the ultimate price for his passion. “THIS is real life. 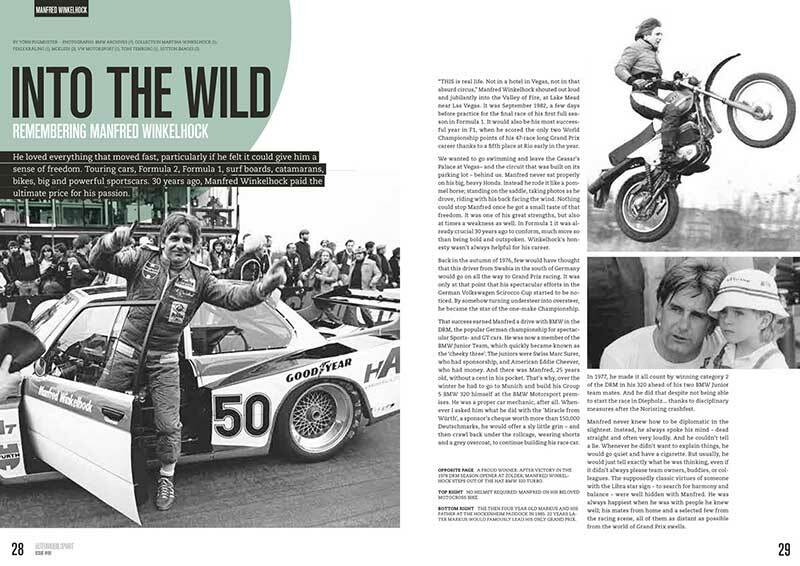 Not in a hotel in Vegas, not in that absurd circus,” Manfred Winkelhock shouted out loud and jubilantly into the Valley of Fire, at Lake Mead near Las Vegas. 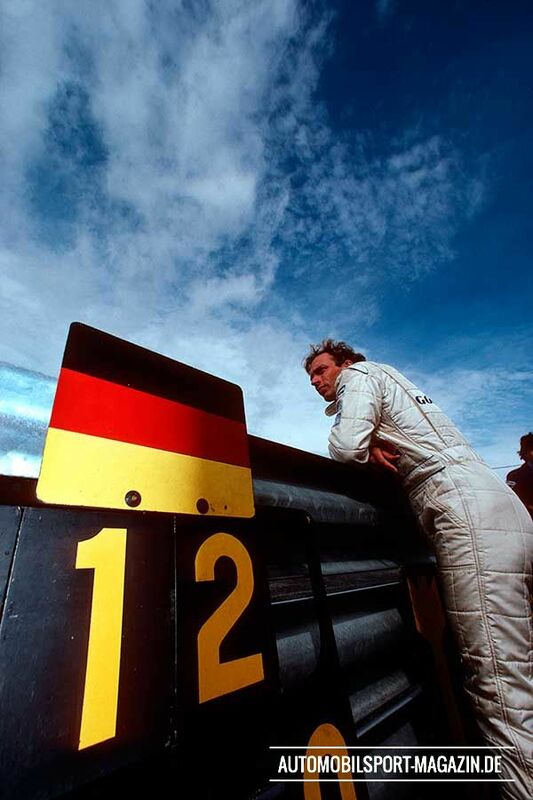 It was September 1982, a few days before practice for the final race of his first full season in Formula 1. It would also be his most successful year in F1, when he scored the only two World Championship points of his 47-race long Grand Prix career thanks to a fifth place at Rio early in the year. We wanted to go swimming and leave the Ceasar's Palace at Vegas– and the circuit that was built on its parking lot – behind us. Manfred never sat properly on his big, heavy Honda. Instead he rode it like a pommel horse; standing on the saddle, taking photos as he drove, riding with his back facing the wind. Nothing could stop Manni once he got a small taste of that freedom. It was one of his great strengths, but also at times a weakness as well. 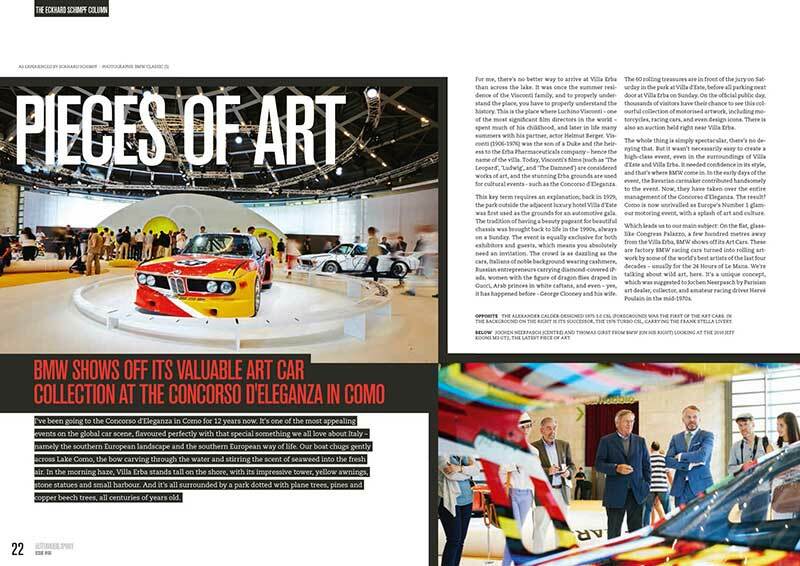 In Formula 1, was already crucial 30 years ago to conform a bit, much more so than being bold and outspoken. 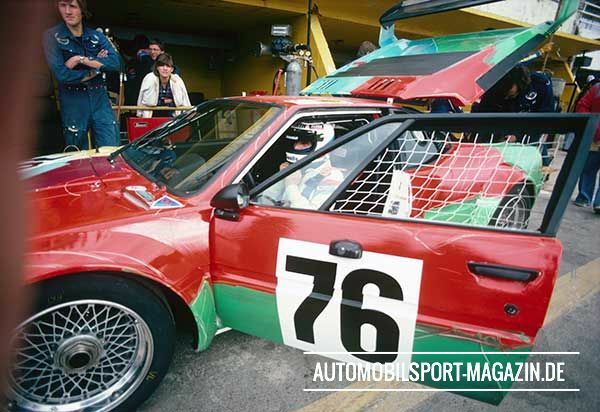 Winkelhock's honesty wasn't always helpful for his career. 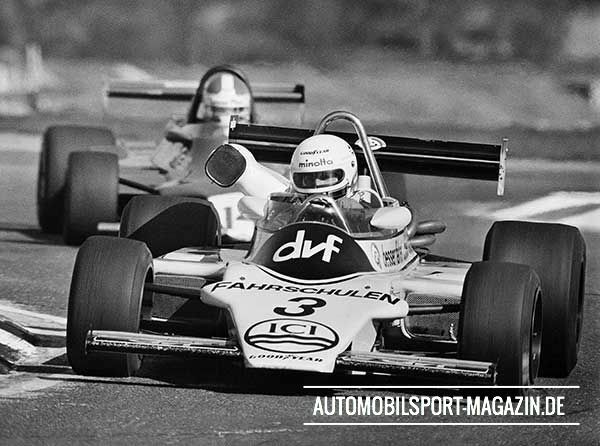 Back in the autumn of 1976, few would have thought that this driver from Swabia in the south of Germany would go on all the way to Grand Prix racing. 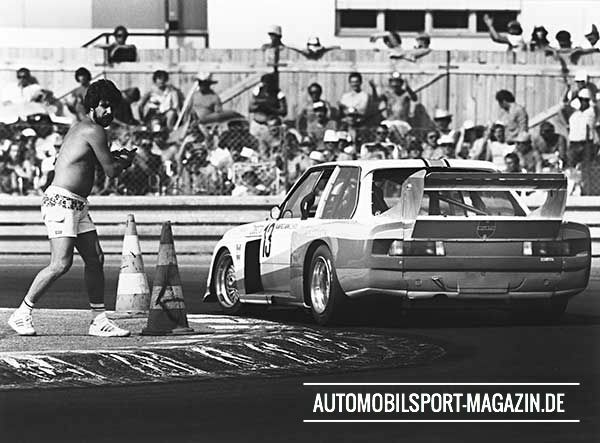 It was only at that point that his spectacular efforts in the German Volkswagen Scirocco Cup started to be noticed. 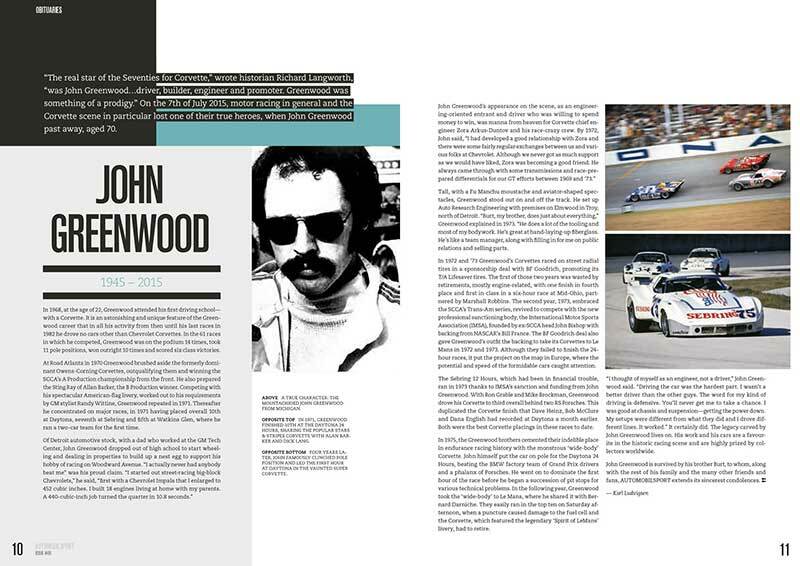 By somehow turning understeer into oversteer, he became a star of the one-make Championship.